Monday, Tuesday, & Thursday: 2:00 p.m. – 4:00 p.m.
FCCLA has three available positions for students who would like to intern with FCCLA’s national headquarters. These internship opportunities, offered during the Summer of 2019, will be available in the areas of Youth Leadership, Competitive Events, and Programs/Partnerships. For more information visit the 2019 FCCLA Internship website. Click here to apply! The 2019 Financial Planning, Housing and Consumer Economics and Internship and Career Fair will be held February 1st, 2019, 10:00 a.m. – 2:00 p.m. Firms will be in attendance looking for students who are interested in full time and internship positions. Please dress in business professional attire and bring copies of your résumé. Is your résumé in need of critiquing? The UGA Career Center is here to provide more information on how to prepare yourself for this event! The list of firms that will be in attendance will be available soon. 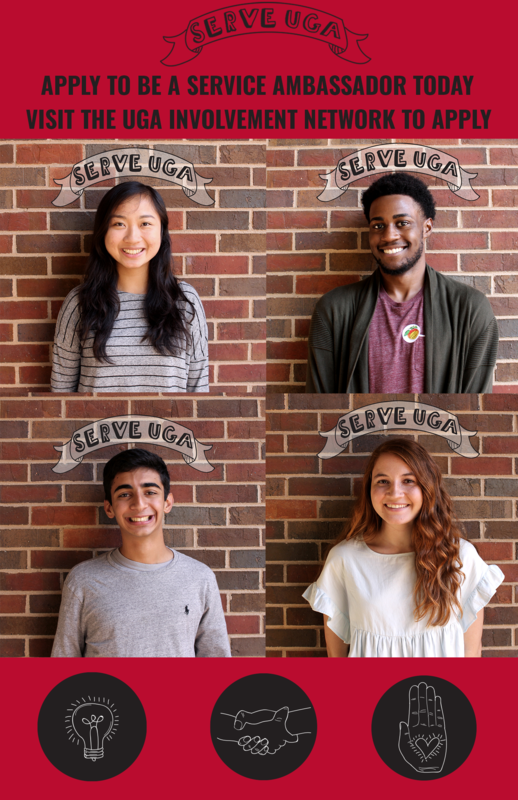 Thinking about becoming an ambassador for Serve UGA? Click here to view the application! Submissions are due November 23rd, 2018 at 11:45 p.m.
About Cortona! This program not only allows students to earn class credit, but students also have the opportunity to experience a beautiful city! Students are housed in the recently renovated John D. Kehoe building that provides students with a beautiful courtyard. Students are able to gain valuable experience while visiting cities such as Florence, Venice, Naples, and more! The Cortona, Italy program will start August 27th, 2019 and end November 20th, 2019. This program has a lot to offer! Early applications are due November 30th, 2018 and standard applications are due March 1st, 2019. Spots are limited! Class Credit! Students are able to earn 12-15 hours of class credit. To see the list of the courses offered, please click here. Application! To apply, please visit the FACS Cortona website or contact Katalin Medvedev . What is SDA? The Student Dietetic Association (SDA) is a student run organization for dietetics majors and those who share an interest in nutrition. This club not only gives students the opportunity to network and build relationships with one another, but students will also be of service to the campus and the community as well. Through programs like Food2Kids and Northeast Georgia Food Bank, SDA members will gain hands on experience and help beat hunger in Athens! This club is a great way to be more involved within your major! Benefits of Becoming a Member! Through SDA, students are able to gain an abundance of knowledge about the dietetic industry. SDA members will be able to build their resume as they interact with guest speakers and other students with nutrition majors. Students also come in contact with firms seeking interns and full/part-time employees. Join! This organization is designated to students who major and have an interest in Dietetics. To become a member, please contact one of the SDA officers! Already a Member? Be More Involved! Attending the SDA meetings is a great way to stay connected with any upcoming events or guest speakers the club may have. SDA holds club meetings every other Wednesday in Dawson Hall. SDA also offers service projects that are available to the students for volunteer opportunities. For more ways to be involved, please contact Hadley Gordon.